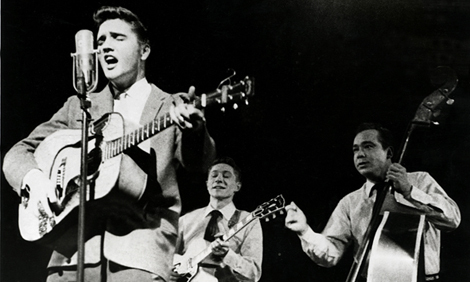 Elvis (left) played many concerts with his band, the Blue Moon Boys, which featured Scotty Moore (center) on lead guitar and Bill Black (right) on upright bass. Sixty years ago, on July 5, 1954, Elvis Presley recorded the song “That’s All Right” at Sun Studio in Memphis, Tennessee. Just a few days later, on July 8, the song was played on the radio, and listeners couldn’t get enough of it. Some consider this event the beginning of rock and roll. Elvis certainly helped make the new kind music very popular. He quickly became one of rock and roll’s biggest stars. Today, nearly 40 years after his death, there are still millions of Elvis fans around the world. This year, the Graceland museum is honoring Elvis’s start in rock and roll with special events and an exhibit, called “60 Years of Elvis.” Graceland was once Elvis’s Memphis home. Visitors can see the first five records he recorded at Sun Studio and many other personal artifacts. The exhibit will be open until February 2015. On July 5 this year, there will be a special celebration in Memphis to honor Elvis’s 60-year legacy. In 1953, 18-year-old Elvis was working as a delivery truck driver. He visited Sun Studio to make a record as a birthday present for his mother. On that day, Sam Phillips, the studio’s owner, recorded Elvis singing two ballads, or slow songs. Phillips noticed something special about the shy truck driver. In early July 1954, Phillips arranged for guitarist Scotty Moore and bassist Bill Black to meet Elvis. Moore and Black thought he had a good voice, but they were not that impressed with him at first. Still, Phillips decided to take a chance and booked Elvis for the July 5 recording session that made history. Look at photos of the “60 Years of Elvis” exhibit and watch a time-lapse video of the exhibit coming together. Learn more about the special events planned to celebrate 60 years of rock and roll at Graceland. When was “That’s All Right” recorded?